Almonds are one of the amazing wonder foods provided by nature.This small nut packs a powerhouse of nutrients that we need in our daily diet.One ounce of almonds provides about 12 percent of our daily requirement of protein and contains no cholesterol. It also provides about 35 percent of our daily allowance of vitamin E, which is a valuable antioxidant with many cancer fighting properties. They are also a great source of minerals like magnesium,phosphorous ,zinc,calcium,folic acid and loads of healthy fiber. Most of the fat contained in almonds is mono unsaturated fat that is good for maintaining healthy cholesterol levels. Now if all this information makes you want to grab some almonds and munch on them immediately..WAIT. It seems that to get the maximum nutrition out of almonds the best way to get them is to soak them overnight and have them the next morning.This is because almonds contain enzyme inhibitors that get neutralized by soaking them.Additionally soaking also makes the almonds easier to digest and helps our body to increase the absorption of vitamins from the almonds. Another benefit ,if you have these soaked almonds in the morning they are also said to assist in stabilizing your blood sugar throughout the rest of the day. So do remember to soak those almonds and have them each morning and also remember to have them in moderation as all nuts are high in calories. I love raw almonds. They are my favorite snack - I always have some in my purse just in case I get hungry. I am off to eat some almonds! I law almonds but I didn't know that we had to soak them first. i saw a great recipe the other day for warm quinoa salad w/ toasted almonds the other day on the go eggless blog (oringially from good housekeeping). I just soak some almonds and eat it :) I like the way it turns soft! Good info! Informative post, Usha. Almonds are a superfood indeed. I had no idea they could stablize blood sugar when soaked-- gotta try that! how long do we have to soak? i like the picture Usha. Thx, i got ur message in gtalk. i was away from the comp when u buzzed me. Thanks for the information. Informative post. Great info dear, love almonds!!! great info. i love almonds. It is good for the facial skin to soak the almonds in water, then grind them on a sandal stone by adding a lil milk and applying to the face. That was some good info Usha.. I have a big bag of almonds that i bought recently. 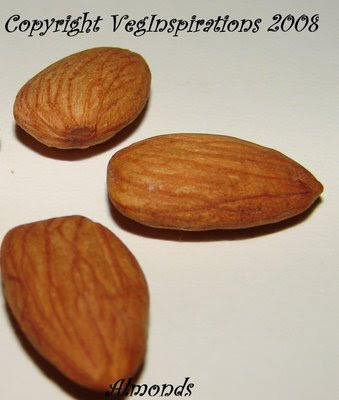 its a very informative post..our family loves almonds. Hi Usha, I just happened to come upon your blog and realized that you had posted on my superfoods post earlier! My latest superfoods articles is out, tell me what you think! Also, I'd like to send a shout out to Miss V, I'm glad you liked the recipe!